Probiotic juice is becoming popular among fermented food lovers and many are making them at home because it is so easy. All you need are the fruits and vegetables, sugar or raw honey, a large, clean jar and a lot of patience because the best ones are those you can ferment for the duration of at least 4 months. However, it is not necessary to wait that long and you can start using them at two weeks old. Consume probiotic juice only in small portions, anywhere between 1 – 4 tablespoons at one time, preferably an hour before taking any food. As the microflora in the juice break down the sugar or honey it makes the vitamins and minerals in the fruits and vegetables readily available to our bodies. I use probiotic juice in my cooking too. I don’t cook them but pour it over the dish once I have finished cooking and turned off the stove. For instance I did this with my Anchovy Sambal dish. I skipped the brown sugar and poured the onion probiotic juice over the sambal when I had finished cooking it and gave it a good stir. It adds the sweetness I need for the dish while introducing good bacteria into it too. 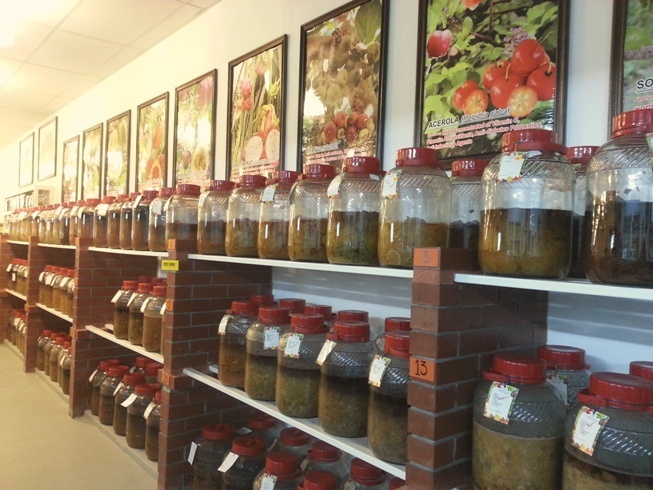 I came across the largest display of probiotic juice I have ever seen under one roof at the Tropical Farm in Teluk Bahang, Penang. It has 250 different species of exotic tropical fruit spread out over 25 acres. The farm’s shop is lined up wall to wall with jars containing much of these fruits bubbling and gurgling in their own liquid at various stages of fermentation. There must have been over a hundred jars. 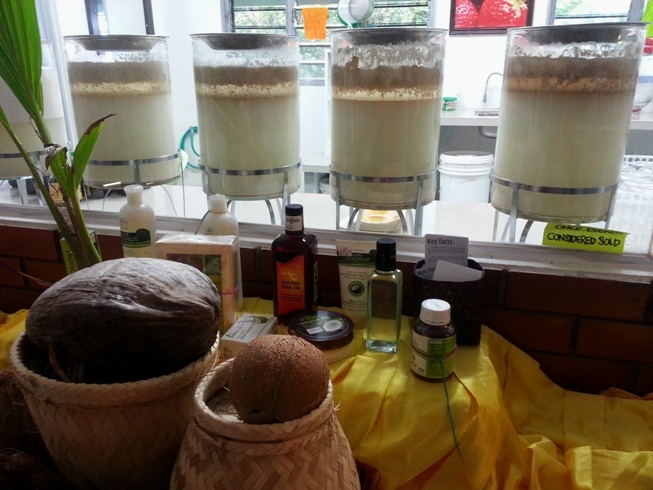 The Farm calls these Living Enzymes and sells them in bottles. I tasted a two month old probiotic juice and 4 months. Both tasted fantastic but there was a sharp difference in taste with the four-month juice being better in the way wine gets better with age. Today I am starting to find probiotic juice sold at health food stores in Australia too. Whether in Malaysia or Australia, they are not cheap especially the longer they have been aged. In Malaysia a 750 ml bottle could cost RM40 (AUD13) and if brewed longer such as four months like the one bought at the Tropical Farm, cost about RM110 (AUD36). The same size in Australia can cost about AUD40 and that too has no indication how long it has been fermenting. So why not make some at home? My paw paw and banana probiotic juice. I stopped the fermentation at two weeks. I give you some samples of my choice of fruits and vegetables used for the probiotic juice and you can use the same method in different combinations. Normally, these are made only with fruit but you can use vegetables too. I prefer to mix the two. 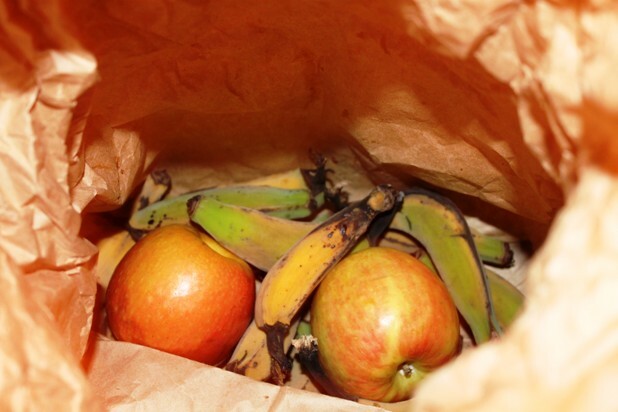 When I returned from Malaysia, I had found my home-grown bananas had nicely ripened in their brown paper bags. I usually take them off the tree while still green but with the fingers a reasonably large size to ripen indoors. To start my first probiotic juice, I used some store bought paw paw and my own bananas. I let it ferment for two weeks and then salvaged the juice. Next I moved on to make two 2.2 litre bottles of onion enzyme and then one four litre jar of home-grown pumpkin, bananas and avocados. 2. Ensure all utensils you use are clean and dry. 3. The idea is not to let any water get into the mixture. 4. 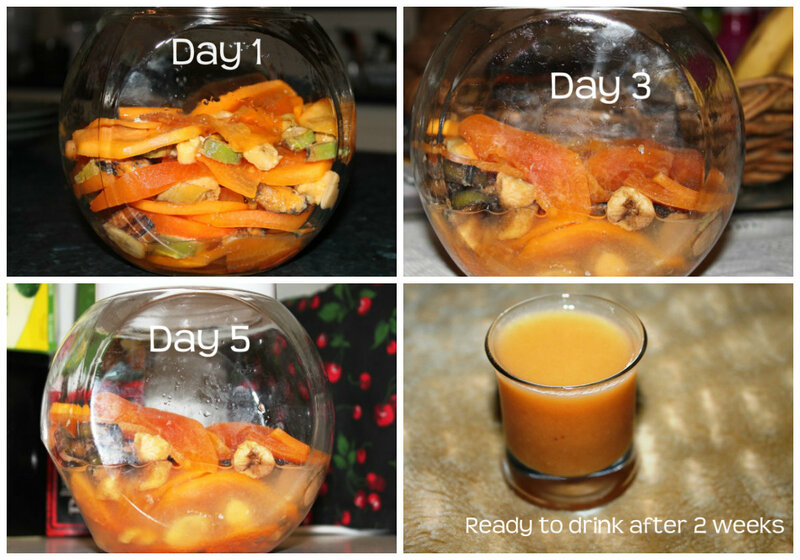 Place the fruits and vegetables in one layer in the bottle. Then cover with a layer of honey or sugar. Then top that with another layer of fruits and vegetables. Place another layer of honey or sugar on top of that. Keep layering this way. The final layer at the top should be the honey/sugar. 5. Ensure the jar is only 80% full because the fermentation will be bubbling due to the activity of the probiotic liquid and could spill over if too full. 6. Leave the top loosely shut. Do not tighten as the fermentation releases gasses and bottle could explode [I’ve heard it has happened though not to me]. Every few days open the cap of the bottle to release the gas and close it. Do not leave it open for longer than a minute. 7. Store in a dark, cool place to ferment. You can also wrap the jar with aluminium foil if you like. 8. During the first week it is best to stir every day or every other day because there won’t be enough liquid yet to immerse the fruits and veggies and stirring helps prevent mold. 9. If you do see a whitish mold at the top over the next few days and weeks, don’t worry. Just scoop it off and stir. 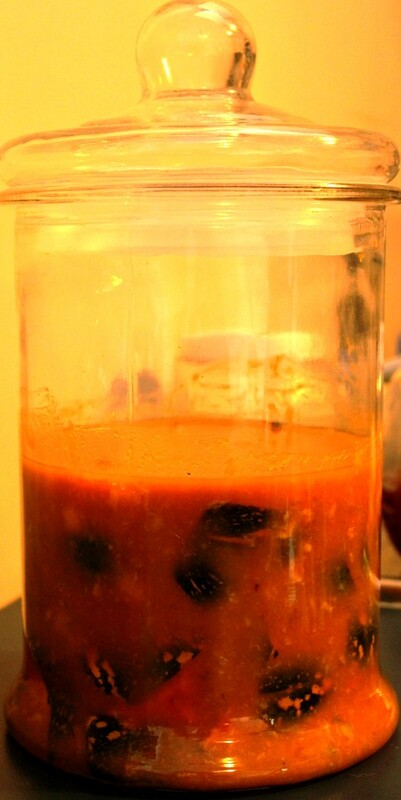 If the mold is blackish it is a different story. It could be contaminated. This could be anything from rotting fruit to water particles having entered. You might want to check the odor and if it is suspect then get rid of the enzyme. 10. Most people stop the fermentation at the third week. 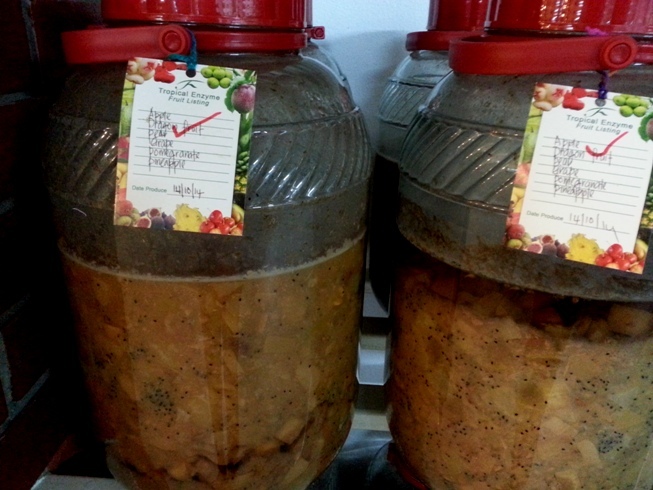 I stopped my paw paw and banana fruit enzyme at two weeks, 2 litres of my onion enzyme at 3 weeks. I am still fermenting my other 2 litres of onion enzyme and will stop that in a month which will be in three days time. As for the pumpkin, banana and avocado I am hoping to go the full nine yards and take it to 4 months. At one month old today, it is doing good and smells alcoholic but sweet and only mild mold which I just scooped off and stirred. 11. Store in old wine bottles that you have washed clean and dried. 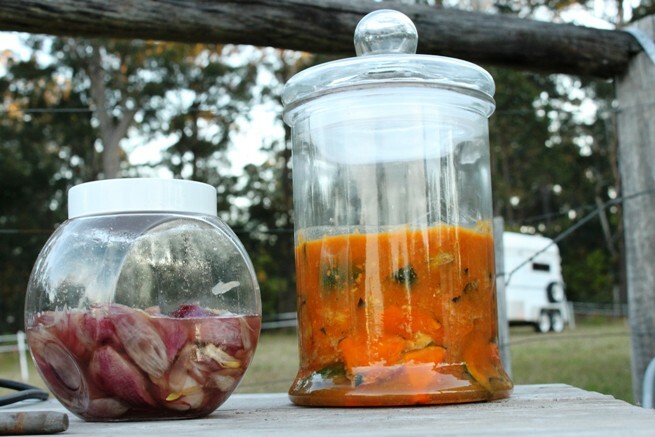 Some people store in ordinary jars and keep them in the fridge. Do youu peel the fruits and vegetables? That depends Karen. If your fruits and vegetables are organic I would put them in with the peel. If not, it is better to remove the peel because of the pesticide that is used commercially. For these in the article, my avocado, bananas and pumpkin were all from my friend’s garden and mine. As for the onions, you have to peel them organic or not. Just peel the topmost layer, not much more.